BPSC Block SC ST Welfare Officer Examination 2018: Bihar Public Service Commission invites online application for Bihar state candidates to recruit the Block Minority Welfare Officers of Bihar SC ST Minority Welfare jobs of through 64th CCE BPSC Combined Competitive Examination. There are total 197 vacancies of Block Minority Welfare Officer posts available in this BPSC 64th CCE recruitment. Those who are looking for these SC, ST, Minority Welfare Departments vacancies they can apply online from 03-08-2018 to 31-08-2018. Official website for this Bihar PSC Welfare Officer jobs application is BPSC.bih.nic.in. Block Minority Welfare Officers recruitment of BPSC will be held in 3 stages.BPSC 64th CCE preliminary exam pattern, Exam syllabus,, age limits, salary and other details for BPSC Block SC ST Welfare Officer (Kalyan Adhikari) and Block Minority Welfare Office jobs of SC, ST, Minority Welfare Departments recruitment exam notification 2018 is given below. For both the posts pay scale is Rs.9300-34800/- Level 6. Minimum qualification is degree for applying these Welfare Officer jobs. Selection for this BPSC Block SC ST Welfare Officer recruitment 2018 will be held based on 64th CCE Combined Competitive Preliminary Exam, Mains Exam and Interview. 64th CCE Pre Exam conducted in the form of objective type. 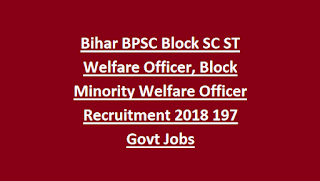 Click here to apply online for the BIHAR PSC Block Minority Welfare Officer Recruitment 2018. 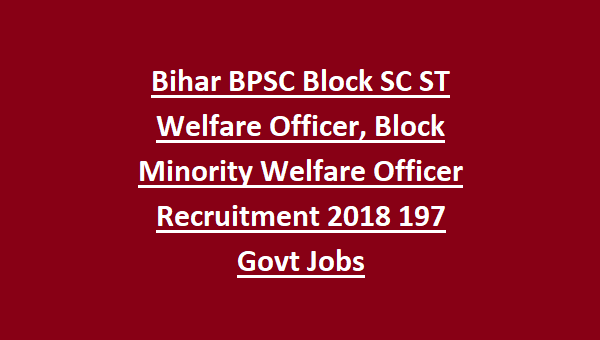 Click here to see the official notice of BIHAR PSC Block Minority Welfare Officer Recruitment. Please share this BIHAR PSC Block Minority Welfare Officer (Kalyan Adhikari) Recruitment Examination 2018 article to your friends.